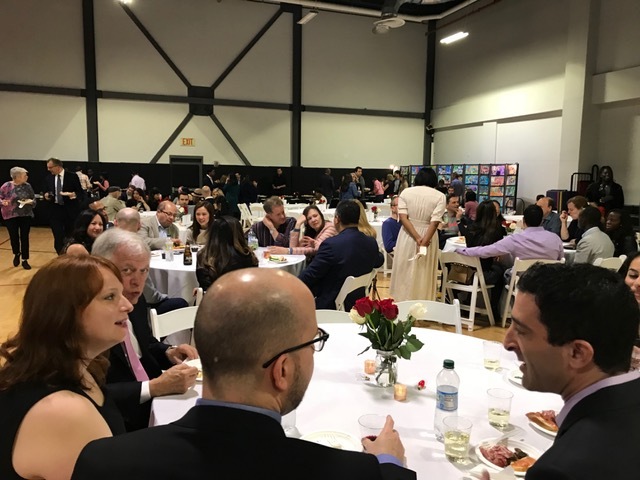 On a rainy Saturday evening right before Mother's Day, our parents gathered on campus to socialize and hear Head of School Hadley Ruggles present her annual State of the School address. 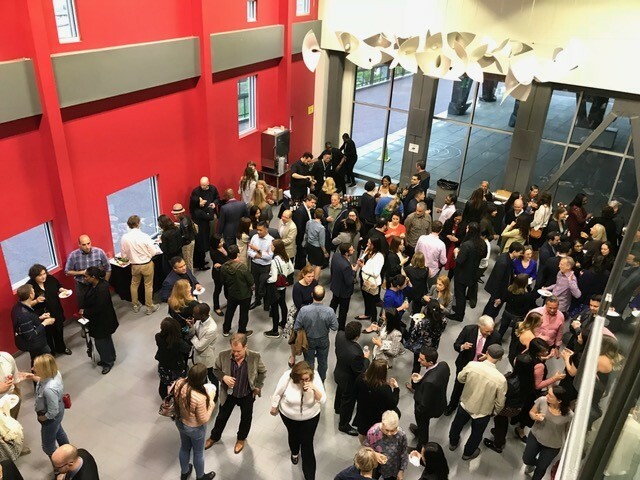 It was an opportunity to relax together and celebrate student accomplishments while looking ahead to the future and upcoming academic year. "As a school, we have much to celebrate. In the past year, we won second place in New York City’s Science Bowl, coming close to defeating the reigning champions of several years. One middle school student not from our school described our team as 'the crowd favorite' for being the new team to take on the old champs!" "We sent our first debate teams to city championships and to state championships, where our 8th grade students (who were granted special exception to compete against much older students) earned 4th in the state." "Our girls’ volleyball team continued their streak of athletic success, and joining their ranks; our boys’ basketball team also made it to play-offs. These accomplishments serve as a few highlights among many more—accomplishments at all grade bands and disciplines." "Going forward, we know that these programs will only grow and our students will do better and better. Competitions provide an exciting way for students to see the application of their coursework in a new context... While there is currently no shortage of opportunity for a student eager to participate in school-based competitions, I look forward to creating more of these opportunities in the next year. In the 2018–19 school year, students will have access to increased numbers of STEM competitions, more robust athletic teams, and of course, the same ability to voice interests and pursue projects with the mentorship of our energetic teachers." "Families and students are attracted to BASIS Independent Brooklyn because of the rigorous curriculum, but it is the teachers who bring that curriculum to life. Our teachers are attracted to BASIS Independent Brooklyn as a place where they can exercise their intellectual prowess, be treated as professionals, and are held accountable for the results that they inspire their students to achieve..."
"While our school community has grown from the 170 or so families of the first year to the 825 families of this year and 900 of next year, we have managed to preserve that uniquely quirky, creative, intellectual, and high-spirited attitude that defines BASIS Independent Brooklyn. 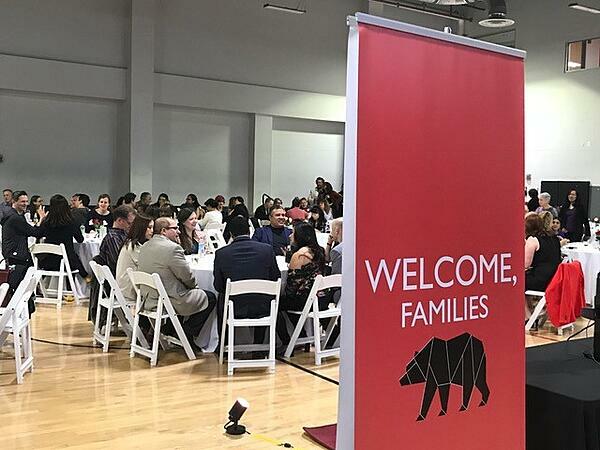 We have upheld the mission of our community—to promote student autonomy without ever impeding a student’s learning; to come together as the adults who support these students, and to create family/community events that bolster these goals." "By all measures, our program is working. We spend many hours reviewing our academic outcomes as a data driven school. Our data informs our practice, identifies our weaknesses, and allows us to knowledgeably celebrate our successes. For these reasons, we can truly say we practice both the art and science of teaching. Without data, we would not understand our own goals, or we would assume we were just lucky when we met them!" 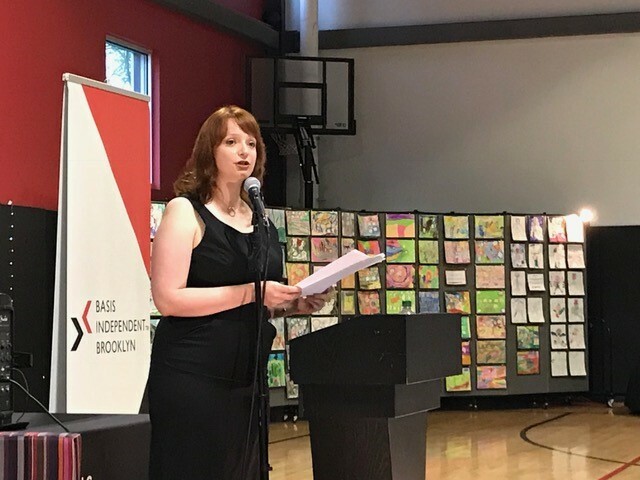 Ms. Ruggles then discussed outcomes from the Baseline Learning Tests (administered in the primary grades) and PreComprehensive exams (administered in the middle grades) that both indicate BASIS Independent Brooklyn has come into its own as a high-performing school. "Perhaps the brightest light ahead for BASIS Independent Brooklyn is our first senior class... [These students] will have each taken a minimum of 6 AP courses, representing college-level work across a variety of disciplines. They will have learned what it means to study, engage deeply, and ask questions of themselves and their instructors. For those of you unfamiliar with the senior year, our students take a series of advanced courses called capstone courses. While AP courses are known for their breadth, capstone courses are known for depth. Through the combination of both AP and capstone courses, we can guarantee our students are college—and life—ready, having been exposed to the foundational aspects of every field and in-depth in a few aligned with their interest." Ms. Ruggles then spoke about the capstone classes offered this fall. "Having led many graduating classes of successful students with excellent matriculation records, I am keen to do the same here in Brooklyn. The future is truly bright for this class of pioneering students."